If you’ve been following this blog you know that the halls of Hi-Fi Central are covered with limited edition music prints for the artist we most admire. One of our favorite artists is this cat named Dan Stiles; his work is smart and hip. His prints often sell out fast and are printed in a very limited run. 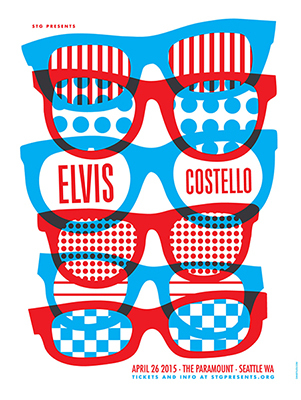 Dan recently released a print for an Elvis Costello show at The Paramount in Seattle, WA; this is a very righteous print and one that we really like. It’s an edition run of 130 and only $30, WOW! Check out this print and others just as cool by clicking here, and tell us what you think of his prints.